Spaghetti Cupcakes – Trick or Treat! 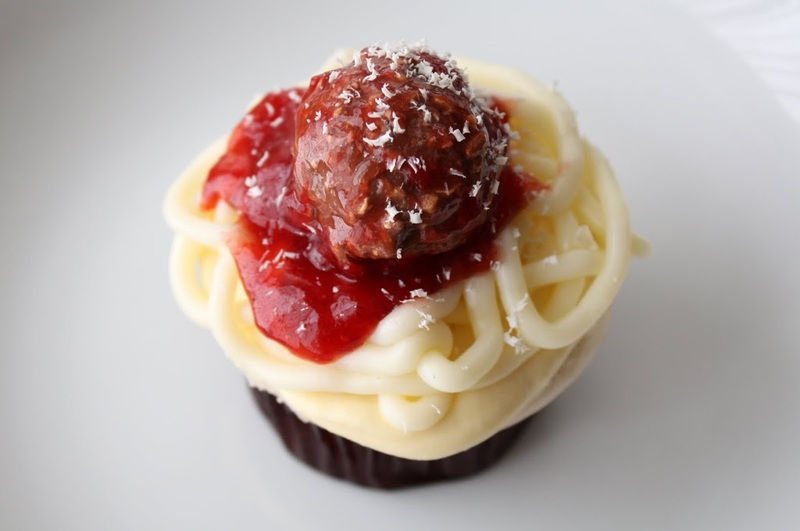 The idea for these spaghetti cupcakes comes from the book Hello, Cupcake!, and I was inspired after seeing my sister-in-law make them for April Fool’s Day. Instead of using canned frosting, I decided to better complement the strawberry jam (the marinara sauce) with white chocolate flavoring. This white cake is filled with strawberry meringue buttercream, and topped with a thin layer of white chocolate whipped ganache, and then covered with white chocolate buttercream noodles. 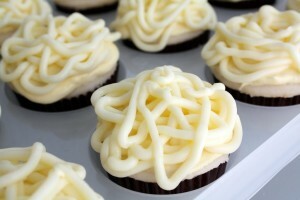 White chocolate and butter both have a pale yellow color, so that no food coloring needs to be added to mimic cooked noodles. A Ferrero Rocher hazelnut chocolate serves as the meatball, tossed in low sugar strawberry preserves (the low sugar variety has a more realistic red shade than regular preserves). Finally, grated white chocolate serves as the parmesan cheese. By the way, I love Ferrero Rocher chocolates. I’m going to have to try a cupcake version of them one day. 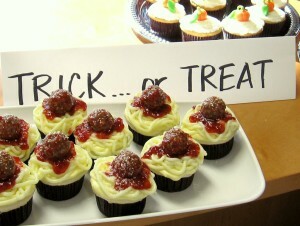 These “trick” cupcakes were complemented by my pumpkin cupcakes as the “treat.” Happy Halloween everyone! 1 Comment on Spaghetti Cupcakes – Trick or Treat! Leslie, you are such a talented baker (and artist)! 🙂 I envy the people at your office or your friends in San Diego (whoever gets to try all these scrumptious looking treats).